For the Harry Potter lover! So I made these for my friend's Harry Potter movie marathon before the premiere of the final one! These are definitely sweet and extremely delicious. The frosting is extra delicious and a bit of buttershots in the ganache adds a little something extra. I love these and need more reasons to make them. They are amazing. Start off by creaming the butter then add both of the sugars to it. Once that is fluffy and the eggs and extracts. Then go between adding cream soda and butter milk. (This is going to look really nasty and chunky but don't worry! )Then you add in your dry ingredients and you'll have your batter! Fill your cupcake tins 2/3 full. Bake your cupcakes at 350 for 15-17 minutes, until a tester inserted in the middle comes out clean. Over a double boiler melt your chips with the heavy cream, and if you choose to add the shot of butter shots. Stir this and make sure to keep an eye on it. Once it is all melted and shiny take it off heat and let it cool. Once cool pour it into a squeeze bottle. Cream your stick of butter and add about 1/3 of a cup of your ganache, 2 tsp of butter flavoring, a tsp of vanilla, and a tsp of salt. Once all of these are incorporated start adding in your powdered sugar until you reach your desired consistency. Once your cupcakes are cooled you can insert some ganache into your cupcakes. Just stick the end of the squeeze bottle into the cupcake and squeeze gently. This well leave a moist little surprise in the middle of your cupcake. So just put your frosting into a piping bag (Ziploc bag) you can use a tip like I did or not. Once your cupcakes are frosted drizzle the ganache over top! And that is all! If you want to decorate with a butterscoth candy it's cute but a little difficult. I didn't have buttermilk so I used a substitute which is 1/2 tbsp to 1/2 c of milk. Let this sit for 5 minutes and it's ready for your batter. I forgot you may want to salt your ganache in case it is too sweet for your tastes. I definitely had to salt it. 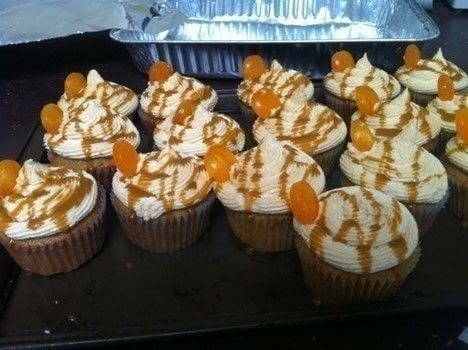 omg these are awesome would you post the recipe?